Mansfield Woodhouse was surprisingly the venue for dirt track motorcycle racing in the early days of the sport, in the Spring of 1928. 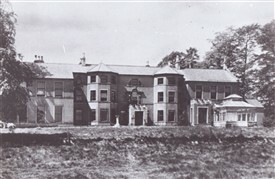 The Mansfield Chronicle of the time advertised it as ‘Mansfield’s new sport’, and was constructed at Park Hall, Mansfield Woodhouse, and situated in the private park of Mr and Mrs W B Makings. The course was opened in late April 1928, and was available for inspection and trial runs by prospective competitors the on Sunday, which the public could watch free of charge, the whole thing was sponsored by the Midland Motorcycle Dirt Track Racing Club, and was hoped to be a great attraction for motorcycle enthusiasts from all around the area. The track was 880 yards in circumference and 30 feet wide, and had three bends. The first meeting was on the 19th May 1928, and the first race being won by E. Housley, a local rider. The track was used again in 1929 and was completely remodelled and relaid with a cinder surface. The exact location of the track in not really known and has now probably been covered by housing. Dirt track racing was similar to speedway racing with the competitors sliding their machines at acute angles around the bends, the competitors would wear special steel shod boots to help them slide around the corners. It had its origins in Australia and in the 1920s was staged there under floodlights; it was very popular attracting 30,000 spectators on Saturday nights in Sydney, Adelaide and various other towns. The Australian riders introduced the sport to England in the early 1920s and became hugely popular from the 1930s onwards. Motor Cycle Dirt Track Club. Abandoned after 4 races (rain). Track half-mile per lap, egg-shaped. Another Mansfield Woodhouse resident, who now is largely forgotten, was at the forefront of grass track racing in the early days of the UK championship, he achieved triple victories for three consecutive years in the 350 cc. Class. 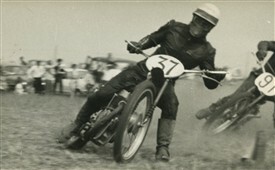 Sid Mintey was the British Grasstrack Champion in 1951, 1952 and 1953 in the 350 cc. Class and finished second in the 1956 finals. He was also 2nd in the 500 cc class in 1952. The finals were staged at Kirkby Mallory in Leicestershire in front of a record 30,000 crowd with a final average speed of 59.01 mph. Sid was a member of the East Midlands Centre team. Sid was an exceptional rider and the feat of winning three British championship titles, should be recognised. Sid was helped in his grasstracking career by another Woodhouse local, Lionel Burdett, who built Sid’s machines for him at his workshop near to Priory Square at Woodhouse. Researching Lionel Burdett we think he used to live in Pleasley in the early 1950s, and had an unusual car for the time, a Riley RME, in black. This page was added by Website Administrator on 20/03/2019.